A stand-up chalk wand isn’t just a knees-and-back saver for grown-ups—though it certainly is that. More importantly (to kids, at least) it’s a lot of fun to play with. Put a piece of sidewalk chalk into the extendible wand, and it acts like an oversized pencil. The shape and size gives a wider reach, making it easier to draw in big, broad strokes. Creator Shauna Damman was recovering from a C-section, so getting down on the ground to play with her two older kids was a no-no. She MacGyver-ed a standup solution with a broomstick and tape. It worked so well that Shauna and her husband, Matt, had several neighborhood kids test different prototypes. The thin, lightweight design that ultimately became Walkie Chalk was the winner. Shauna’s idea means no more bending over for adults, but more fun for kids—which will make everyone happy. Hello everyone! I'm proud to introduce Walkie Chalk to Grommet! 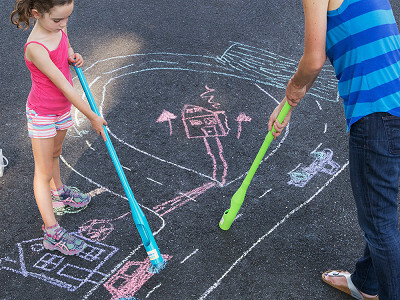 Now everyone can 'Stand Up & Draw' with sidewalk chalk. I'm happy to answer any questions you may have! Shauna, how many wands come in one set? Have two granddaughters who love sidewalk chalk. Wonderful idea as their parents love Art too! Hi @Katie - thanks for your interest! One wand per set/package... each wand comes with 2 pieces of sidewalk chalk as well. Your granddaughters would love this, I'm sure! Shauna, I am surprised to see that you didn't note how fantastic this product would be for children and adults who are in wheelchairs or living with other disabilities that prohibit or interfere with their ability to get on the ground to draw with sidewalk chalk. Please consider adding this as a point of marketing, as I'm sure parents (and adults) will be overjoyed at the opportunity to enjoy such a wonderful childhood pastime. Thank you! Shauna, re-reading my comment---I failed to say that this is a GREAT product and as someone who works with children with disabilities, I'll be sharing it with their parents! Best of luck to you with Walkie Chalk! Hi @Elisabeth ! We're well aware of the benefit to those with special needs- we're currently working with a few organizations to get more visibility within that community. 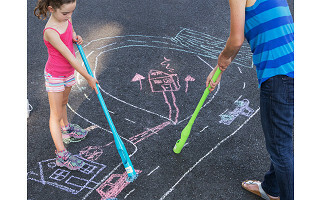 When we came up with the idea for Walkie Chalk, it was more for the parents and grandparents and also giving the kids a new way to play- a way to be creative and from a different prospective. Over the past year since Walkie Chalk has developed, we've had a phenomenal feedback from art teachers, occupational and physical therapists and those within the special needs community! All fantastic avenues for us to further explore. We just felt is was more appropriate to let it happen organically. Thanks for your comment and support! @Shauna You say it comes with 2 pieces of sidewalk chalk. I doodled my driveway last year but this year I have a broken foot so I couldn't do it. With this I could. I have 2 containers of sidewalk chalk from when my niece and nephew were younger. Can I use that chalk in this? I think I want to get one! Hi @Gail- Thanks so much for reaching out! Our Walkie Chalk fits *most* standard round sidewalk chalk. Our patented foam design also holds the square chalk found in stores. Sorry to hear about your foot- hopefully this helps you! A stand-up chalk wand isn’t just a knees-and-back saver for grown-ups—though it certainly is that. More importantly (to kids, at least) it’s a lot of fun to play with. 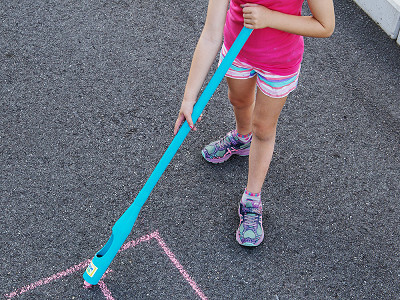 Put a piece of sidewalk chalk into the extendible wand, and it acts like an oversized pencil. The shape and size gives a wider reach, making it easier to draw in big, broad strokes. Creator Shauna Damman was recovering from a C-section, so getting down on the ground to play with her two older kids was a no-no. She MacGyver-ed a standup solution with a broomstick and tape.